The major Parisian public transport operator RATP announced via the French news agency AFP today that from 15h00 on the bus network in and around the city was „paralyzed“. Just „a couple“ of bus lines – out of 350 – were working normally. And all of this due to the „heavy snow falls“ the city fhas faced for the last couple of hours. The governor of the Ile-de-France-region has banned all heavy loads from the highways, where the traffic has ground to a halt anyway. Versailles is practically cut off, in Seine-Saint-Denis they’ve closed several tunnels as a matter of precaution. Now you might think: look at these pampered Parisians! Some snowflakes are enough to bring them down! But that’s where you’re wrong: this is serious snow, it really feels like a day in the Alps – and it is, of course, great for all people who aren’t waiting for a bus. The pavements, the rooftops are dressed in white, the icy flakes are dancing in the air, children have snowball fights, screaming and cheering, it’s a marvel. 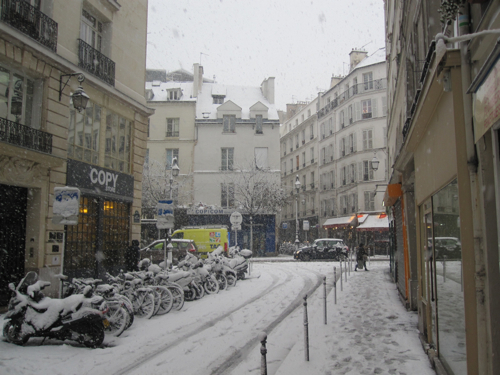 And it’s a miracle, too: in recent years, Paris has hardly seen a winter like this. It is in fact unusually cold and it is unbelievably wintery out there. The Eiffel tower has been closed in the afternoon, normally that only happens if there’s a real and tangible threat by terrorists. 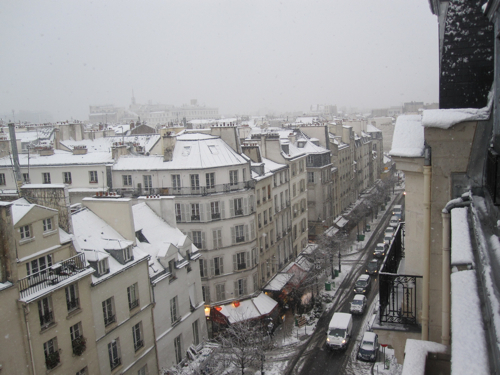 Time to start dreaming of a white Christmas, actually!